Yarmouk refugees are facing death in its most deplorable of forms: starvation. Their ambivalent stance was not enough, for no middle ground is safe in the Syrian war. No middle ground to be found there anyway. And the worst thing that could happen to the Palestinian refugees in the Yarmouk Camp is being impartial at a time when the Arab World is so thoroughly drenched in Bush’s woebegone doctrine of “you’re either with us or against us”, a time when divisions reign supreme and self-imposed partitions are the order of the day. They were demanded to choose a side and choose it quickly, either the hammer or the anvil… only to be crushed in between. The strategic geographic location of the camp on the southern outskirts of Damascus meant that its residents were no longer spoilt with the luxury of safe choices, a deadly case of damned if you do and even more damned if you don’t. It also meant that the Palestinian refugees inside the camp were reduced to nothing more than a small “inconvenience” in the ever onward, grinding pursuit of military supremacy from both sides of the conflict, a mere banal obstacle to be gotten around when military commanders unfurl their maps and plot their next counter-attack, and it’s always a counter-attack… with plenty of “collateral damage” sure to be left in its devastating wake. The Islamist armed groups of the opposition saw the camp as the Syrian government’s Achilles’ heel and nothing else, a prize-catch in their desperate quest to “conquer” Damascus; the perfect springboard for their intended “Jihad” against the regime’s main stronghold, practically putting a target on the camp’s back and turning its entire refugee population into a huge block of human shields held hostage to the flick of these groups’ military whims; not that it was going to deter the Syrian government anyway which in turn saw the camp strictly as a potential (intolerable) breach in its skintight security belt around the capital. One that needed to be fixed… militarily. The armed opposition’s all-guns-blazing infiltration into, and subsequent control over Yarmouk in late 2012 has plunged its Palestinian refugees headfirst into the throes of the Syrian war; transforming the largest Palestinian refugee camp in Syria into a “hostile territory” for the Syrian Army. It certainly didn’t help matters that Palestinian factions inside the camp actively took opposing sides in the Syrian civil war, with Hamas (or the remnants thereof) siding with Islamic opposition fighters (purely on ideological, sectarian grounds) and the Popular Front for the Liberation of Palestine – General Command (PFLP – GC) siding with the regime; the camp became a sandbox for Islamist militants and anti-government dissidents to wage their holy war against Syrian President Bashar Al Assad. For the Al Nusra front and other Islamist fighting militias; taking control over the camp was primarily a matter of scoring territorial advances against the “infidel” regime, it constituted the closest front they’ll ever manage to get to Damascus, only this “pyrrhic victory” has had the camp caught in a tight militaristic death-grip where foreign backed insurgents are wreaking doomed havoc inside the camp (including looting, arbitrary seizure of properties and taking on human shields), and the Syrian army is giving the area the full “military-zone” treatment; imposing a full-fledged siege on most parts of the camp, particularly its northern entrance which connects directly to Damascus. Today residents of the Yarmouk camp find themselves caught in the midst of a marathonic scorched-earth power struggle between the two warring parties with minimal to zero regard for civilians caught in the crossfire, whose lives have practically devolved into feeding on grass, leaves and animal feed. Stripped away from their humanity and squashed down to near-invisibility, Palestinian refugees inside the camp are now either lost in the tall grass of callous military calculations and battle maneuverings, or forgotten under the crust of reshuffled priorities of bickering Palestinian factions, all the while facing death in its most deplorable of forms: starvation. Forty-six people have died of hunger, dehydration and malnutrition in the Yarmouk camp, and this number is looking to rise; especially with the trigger-happy insurgents inside the camp preventing aid convoys from advancing further and stonewalling all attempts at delivering much needed humanitarian aid and supplies to the malnourished population. According to UNRWA spokesman Chris Gunnes, the latest PLO/UNRWA joint relief convoy could not make its way through to the camp after a bulldozer, provided by Syrian authorities to clear the road for the convoy, was targeted with direct gunfire followed by a mortar shell landing close to the UNRWA trucks, forcing them to retreat. Though Gunnes’s statement did not assign blame for the assault; Ahmad al-Majdalani, Palestinian minister of labor and head of the PLO delegation dispatched to Syria, accused the Islamist rebels controlling the camp of opening fire at the six-truck relief effort, therefore torpedoing the whole mission; especially that the attack occurred near the southern entrance of the camp over which Syrian authorities have minimal control and where the insurgents do enjoy the upper hand, with extensive military presence on the ground. In a press conference held last week in Damascus, Al-Majdalani said that “terrorist militias are committing a war crime by kidnapping the camp and hindering the planned evacuation of patients, children and elders through a safe route by targeting the gathering point with live ammunition”. Whether you choose to believe the words of Ahmad Al-Majdalani or dismiss them as mere politicized finger-pointing, the curious fact remains that while the civilian population is suffering the lashes of hunger, thirst and dwindling medical supplies, militants inside the camp appear to be largely unaffected by the siege. On the contrary these groups seem to be well-armed, fully weaponized (at least to the extent that enables them to retain full military control over the majority of the camp despite the ongoing siege) and on multiple occasions have even instigated clashes and firefights with the Syrian army. This begs the question: what prevents these militants from using their own supply routes and active ammunition channels to soften the impact of the regime-imposed siege on the civilian population inside the camp, keeping in mind that areas bordering Yarmouk from its southern entrance are controlled by the “rebels” themselves? Trickling accounts and appeals coming from the residents themselves inside the camp through social media websites paint an even grimmer picture; the rebel’s inglorious exploits of the camp’s dire strait run amok, monopolization of food and other basic commodities to finance their “Jihad” has become a matter of legitimate practice, the business of confiscating and selling stolen properties at gunpoint is booming while sniper fire is preventing people from exiting the camp. The Syrian regime’s siege on the outer periphery of the camp is compounded with yet another siege imposed from within, courtesy of the foreign backed insurgents. Many of the dire consequences of embroiling the Yarmouk camp in Syria’s civil war go straight to the foreign-backed groups’ doorstep, who themselves have made a living out of imposing similar (if not more brutal) blockades on entire civilian areas (the Shiite villages of Nubl and al-Zahraa have been under a crippling siege from the armed opposition for more than a year and a half now, albeit without the media uproar). Turning the camp into a free-fire zone and a forward base for anti-government operations brought nothing but agony and mass punishment for not only Palestinian refugees but for Syrians as well; the suffering in Yarmouk camp is but a miniature version of the catastrophic deluge that has been sweeping the entire country for three years now, and the minute this foreign financing of the war in Syria stops, the overflowing sea of innocent blood subsides. However that shouldn’t absolve the Syrian government from responsibility, for whom the slightest of security concerns and military calculations outweigh the value of a human life ten-fold over; after all when negotiations for temporarily opening a couple of humanitarian routes to the camp seem like an exercise in utter futility and a thing that is next to impossible to achieve, it is a profound indictment of all parties involved in this war. Both sides have proven track records of committing war crimes, both sides endorse blockades as a matter of course and both sides are contented with the current status-quo in the camp. It is a status-quo that’s harvesting the lives of Palestinian refugees by the day in starvation, thirst and malnutrition; a status-quo that has transformed basic food and drinkable water into unattainable luxuries; a desolate status-quo that has turned the camp’s suffering into a mere political scoring board for rival Palestinian factions and their regional patrons to capitalize on the ensuing tragedy. – Ahmad Barqawi, a Jordanian freelance columnist and writer based in Amman. He contributed this article to PalestineChronicle.com. 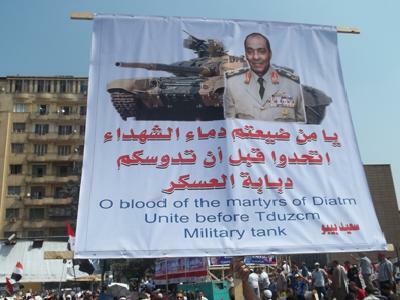 Only in Egypt, Progressive Liberals Support Military Dictatorship!